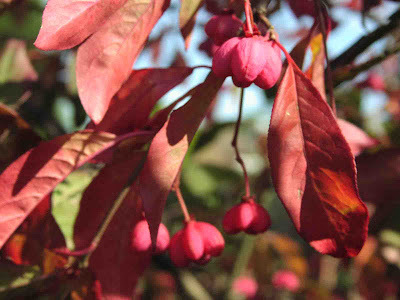 Pronounced ewe-on-i-mus ah-lah-tus, the Winged Spindle bush, which is the common name, can be relied upon to provide rich, striking autumn colour year after year. During October and November, its small deciduous leaves change from dark green, first to rosy pink, then to a more vibrant crimson, clinging to the branches for ages. It is a bushy dense shrub, relatively slow-growing, but when mature reaching 8 feet (2.5m) high and wide. Adapting to most conditions providing there is reasonable drainage, and will tolerate either sun or shade. The inconspicuous greenish flowers in summer are followed by purple and red fruits with scarlet seeds, but one word of caution though, all parts of this plant are toxic. Once the leaves have fallen, it has a winter skeleton of branches with conspicuous flattened ‘wings’ suggesting its common name.